Iraq's federal police forces celebrate as they hold a flag of the Islamic State group they captured after regaining control of Gawsaq neighborhood in the western side of Mosul, Iraq, Feb. 27. 2017. "They have sleeper cells. They have networks," Najmaldin Karim, the governor of Iraq's Kirkuk province, said during a recent visit to Washington. "They exist everywhere." Perhaps the terror group's most successful and insidious tactic is its use of teenagers, young enough to avoid suspicion but old enough to be highly effective. U.S. and Iraqi officials describe them as the first wave of brainwashed youth truly capable of serving IS's cause. "Those who were 14 or 15 years old when ISIS came, now they are very active," Karim said, describing them as hardened veterans. FILE - A still image taken Dec. 11, 2016, from a video released by Islamic State-affiliated Amaq news agency Dec. 10, 2016, purports to show Islamic State fighters advancing over the Hayan mountain south of Palmyra. "They are not included in databases," he added. "They can easily mix with the IDPs [internally displaced persons], come into camps and enter cities without anybody knowing. They think they are just kids." U.S. officials have been reluctant to estimate how many teenagers IS is using or has tried to use to establish sleeper cells in IDP camps or in other areas where it has ceded control. But some aid groups say the extent to which IS has sought to use children may be like nothing anyone has seen before. "The challenges created by the systematic use of children by armed groups in Iraq are unprecedented in scope and scale," the U.N. child relief agency (UNICEF) told VOA in a statement, adding the problem remains "difficult to address in Iraq's complex environment." And it's not just teenagers. Older IS fighters are also trying to sneak through the screening process or simply embed themselves in predominantly Sunni areas. 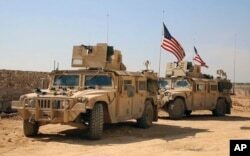 U.S. defense officials have said even relatively recently liberated areas, like Manbij, Syria, where the U.S. has maintained a small military presence, are not immune to sleeper cells. "They are hiding amongst the civilian population all over Iraq and Syria," Lieutenant General Stephen Townsend, commander of Combined Joint Task Force — Operation Inherent Resolve, told reporters this month. "We're focused on chasing them out in a sort of sequential campaign. "It's our intent with our partners to go root them out of the other population centers first and then chase them into the valleys and river valleys and palm groves and the rural areas." But with Iraqi and other coalition-backed forces still focused on Mosul and Raqqa, any comprehensive rooting out has yet to begin. And there are areas in Iraq and Syria, along both the border and in the Euphrates River Valley, where IS still has considerable freedom of movement and influence. U.S. forces take up positions on the outskirts of the Syrian town, Manbij, a flashpoint between Turkish troops and allied Syrian fighters and U.S.-backed Kurdish fighters, March 7, 2017. 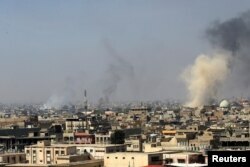 There is also evidence of IS fighters trying to regroup in Hawija, in Iraq's Kirkuk province, where according to the provincial governor, about 1,000 militants are keeping the population at bay. "They [IS forces] still possess large numbers of basic arms, ammunition and explosive material," said a U.S. defense official. "I think they still believe that they can function and are still making plans to function as a pseudostate," the official added. And despite U.S. data, which suggest as many as 60,000 IS fighters have been killed in airstrikes alone, the terror group still possesses a significant fighting force. U.S. military officials put the number at 12,000 to 15,000 militants, roughly split between Iraq and Syria, and they estimate that almost a third are willing to die for the cause. "Having watched ISIL now for its two-plus years of existence, I don't expect ISIL to suddenly collapse from a lack of morale," Townsend said this month, using another acronym for the terror group. "The foreign fighter percentage, those hard-case guys, are probably only about 10 percent of the enemy's ranks," he said. "There's probably another 10 or 20 percent that are very hardened local fighters and regional fighters." As for the average IS fighter, "he's probably willing to follow the orders of his leadership," Townsend said. U.S. and Iraqi officials see indications that those orders are increasingly focused not on preserving the remnants of the group's caliphate but on sowing terror and division across Iraq's ethnic and sectarian lines. "The caliphate will come to an end in Iraq; they will no longer be able to hold territory," said Bayan Sami Abdul Rahman, the Kurdistan Regional Government's representative to the U.S. "But we believe the terrorism will continue." Intelligence officials believe IS has been slowly but surely adapting its strategy for nearly a year, pointing to the last audio message from former spokesman Abu Muhammad al-Adnani. Smoke rises from the old city during a battle against Islamic State militants, in Mosul, Iraq, March 26, 2017. "Will we be defeated and you victorious if you took Mosul or Sirte or Raqqa or all the cities — and we returned as we were in the beginning?" Adnani asked last May. "No, defeat is losing the will and the desire to fight." IS leader Abu Bakr al-Baghdadi further laid the groundwork for the shift in November, saying in an audio message distributed online that "this total war and the great jihad only increased our firm belief, God willing, and our conviction that this is all a prelude to victory." "It's ISIS morphing into an al-Qaida model where they don't plant flags, they don't say they own this neighborhood, they don't say they own this town, but they're able to conduct terrorist operations out of them — car bombs, assassinations, start recruiting, start intimidating the reconciliation process," Michael Pregent, a former intelligence officer now with the Hudson Institute, a Washington think tank, warned during a panel discussion last month. The KRG's Rahman believes with trust among Iraq's various communities already at a low point, every terror attack IS is able to pull off allows the group to sink its roots even deeper. "It's a local entity," she said. "Ultimately, ISIS grew out as an offshoot of al-Qaida in Iraq and then a sort of pulling together of Baathists who still hanker to come back to power and also the Sunni public — not necessarily the Baathists or the extremists, but the Sunni public who felt totally marginalized." 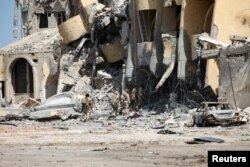 Libyan forces allied with the U.N.-backed government walk through a destroyed building during a battle with Islamic State militants in Sirte, Libya, Oct. 2, 2016. As an example of how things could play out in Iraq, some U.S. officials point to Libya, where IS has held on despite a series of major losses, including its coastal stronghold of Sirte. "Anywhere you have a weak or unstable or no government, that's a breeding ground for ISIS," U.S. Africa Command's General Thomas Waldhauser told Pentagon reporters last week. "Consequently, with the situation in Libya as it is, ISIS has not left." Some analysts argue the ability of IS to maintain some semblance of command and control in Libya, where its core force was whittled from thousands of fighters to just a few hundred, may not bode well for Iraq, where a greater number of fighters have local ties. "Grievances are being created. There's no sign even halfway competent governance is going to fill the void," said Daveed Gartenstein-Ross, a senior fellow at the Foundation for Defense of Democracies, a terrorism research group. "That should be of deep concern," he said. "It's possible to win this battle against ISIS and yet in terms of the broader war against Islamic militancy to have either ISIS make a comeback or al-Qaida to fill in the void or some other group."